Harleston School Lane postmill was in the Redenhall end of the town that in the early 1800s was known as Redenhall with Harleston - all that part of the Town of Harleston to the South and East of the Turnpike Road which passed through the town from Bungay to Scole. The mill had a 21ft diameter roundhouse and ran two pairs of French burr stones. The mill was built c.1824 and may have been on the site of an earlier mill. 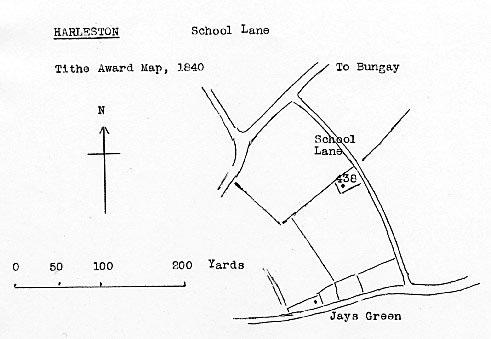 As late as 1861, School Lane was still also known as Mill Lane. To be Sold. Situate in Harleston. A Substantial POST WINDMILL & Situation with all its going geers & appurtenances thereto belonging. Inquire of Mr. J. Vipond of the place aforesaid or the tenant who will shew the premises. Roger Brock, of Mendham in Nfk. MILLWRIGHT. Executors: Wife, Mary Brock, David Feaveryear of Starston and Robert Woods. Everything left to his wife and All that my Post Windmill with the Flour Mill Stones, going gears and all other Tackle thereto belonging situate, standing and being upon a piece of land or ground in Redenhall with Harlston, which I hold as tenant to the late Henry Baldwin under a lease. The will was written on 3rd April 1821 and proved on 1st October 1824. It would appear that Roger Brock leased the land but owned the windmill. A Very Capital recently erected WINDMILL with two pair of most excellent French stones & other apparatus, late the property of Mr. R. Brock deceased under Lease to Mr. Asten (nine years of which are unexpired) at the annual rent of £33. Further particulars of Mr. Woods, St. Margarets, Mr. Faveyer, Starston & of the Auctioneer, Mendham; letters to be post paid. Lot 1. A very spacious old established POST WINDMILL in substantial repair, driving two pair of French stones, going gears & machinery in good order & condition, erected on a brick roundhouse 21 feet in diameter. Also a comfortable Dwelling house with parlour, kitchen & convenient offices attached, Garden, Mill Yard & small paddock of productive Pasture Land, Stable, cart lodge, Piggery & other suitable outbuildings, the whole containing with the site of the building 1a.1r.0p. & now in the occupation of Mr. Robert Asten the Proprietor who is retiring from business. The Property is Freehold & situated in Harleston a short distance from the town near the high road leading to Bungay. The Mill is well winded & within a convenient distance of good corn markets. Possession will be given on completion of the purchase. Land Tax 19s 2d. Tithe Rent Charge 8s 4d. A considerable portion of the purchase money may remain on Mortgage of each lot if required. Apply to Mr. Barnaby, Harleston or Mr. Bardwell, Solr. Harleston & the Close, Norwich. Robert Astren's son, John Asten, was the miller at Homersfield watermill . WANTED, a steady sober Man about 50 or 60 without encumbrance to work a Windmill, grist & small retail trade. Apply by letter. N. W. Post Office, Harleston. WANTED, a steady elderly Married Man to work a windmill. Apply by letter to B. W. R. Post Office, Harleston. 1824: R. Brock (deceased) owner; Robert Asten, tenant miller with a 9 year unexpired lease at £33 p.a. 1827: Robert Asten, tenant miller with a lease due to expire 6th April 1833 at £33 p.a.